The G2 Symbol Men pack contains 3D-Ready abstract characters perfect for reports, presentations and infographics. Assemble your avatars into a variety of conceptual personalities by mix & matching their body parts and accessories, while being able to instantly change their color styles. Create funny and practical avatars with these streamlined heads that contain facial expressions for a wide variety of abstract uses. 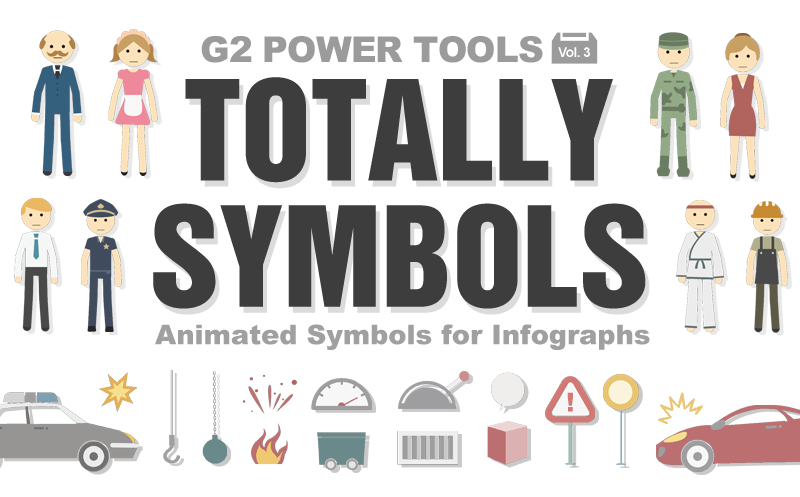 Use them in combination with your Symbol characters for posters, pamphlets, or just about anything. Each head has its own animatable facial expressions and can also be used in a variety of angles and color palettes. Action Items galore! In this pack you will find a variety of action and game assets that can be easily employed in creative level designs or background visuals. Find a collection of animated props and gadgets that you can be used to bring life to any wallpaper or game stage. 5 especially designed color palettes that allow you easily create stylish and consistent business infographics, reports or training videos.